In this video we will discuss how to pass and retrieve parameters from URL in AngularJS. This is continuation to Part 29. Please watch Part 29 from AngularJS Tutorial before proceeding. 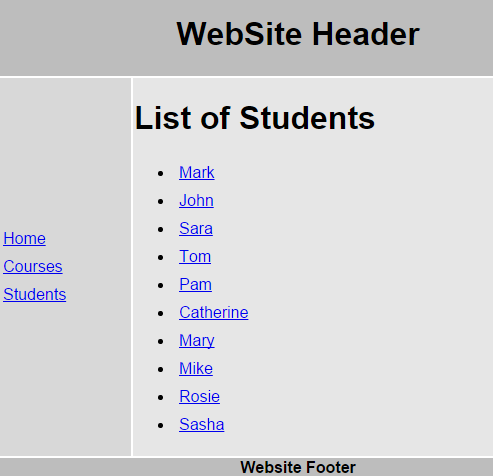 Here is what we want to do : When we navigate to /students, the list of student names must be displayed as hyperlinks. When we click on any student name, the respective student details should be displayed as shown below. When we click on "Back to Students list" it should take us back to students list page. After adding the above method, the complete code in StudentService.asmx.cs should be as shown below. Step 3 : Now let's create an angularjs route with parameters. Add the following route in script.js file. 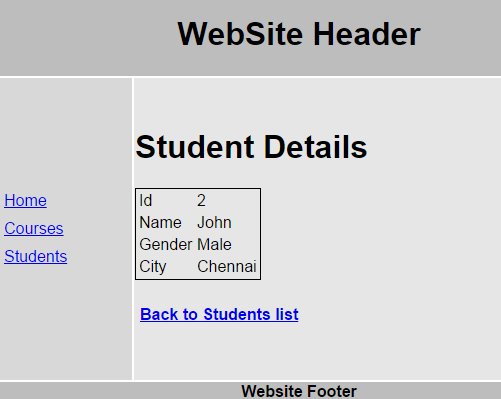 Our next step is to create studentDetails.html partial template and studentDetailsController. With the above change, the code in script.js should now look as shown below. Please pay attention to the code highlighted in yellow. Step 4 : Right click on Templates folder in solution explorer and add a new HTMLpage. Name it studentDetails.html. Copy and paste the following HTML. Step 5 : Add studentDetailsController in script.js which calls GetStudent web method and returns the requested student data. i'm working on a marksheet printing software in which we want to print students marks as graph in efficent and fast way , how could it achieve. my some coliques told me that it would not acheieve through dot net it achieve through JAVA only. pls help me . Error msg is 404 not found.. I am facing the same issue. Did you find its solution. I am getting error. Hello This is different question. Could you please upload CRUD With Angular Js.